39.1 Floreant comes with basic kitchen display system. OROCUBE also provided pro version with bump bar support and extra settings. NOTICE: This Page is OUTDATED. Visit http://floreant.org for latest developments. 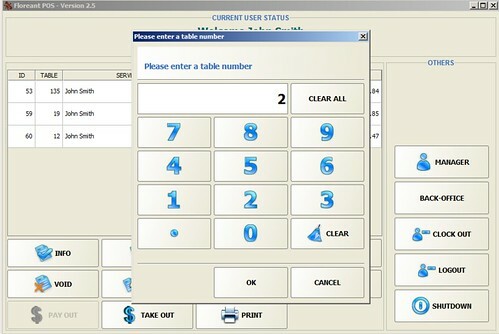 Floreant POS is the first known enterprise-grade touch screen POS for Restaurants released in the Public domain. We designed it as per the requirements of a famous food chain, and since its first release in sf.net in 2009, some installation has been growing sharply and it achieved reputation and popularity. Only in sf.net, it has more than 100,000 downloads. Many restaurants in the USA are running its 1.0_2 & 1.0_3 since 2010. People translated, customized and migrated Floreant as they want. Because of its intuitive interface and portability, it has been used by Retail store and Hotels too. Restaurant POS is more complicated than the Retail counterpart. In Dine In culture, tickets are left open for a longer time, guests can add more and more food and its essential restaurant manager correctly utilize tables and menus. Quality of food depends on efficient management of the kitchen, keeping an eye on service, reducing wastage and managing people. In 2014 we added huge features, and we have nightly releases in every few weeks. Our current version 1.4 has huge changes from its predecessors. The user interface has been cleaned up; they are made more professional. We streamlined payment windows, refactored database, and provided Plugin architecture to support commercial plugins like the kitchen and floor plans. Many of our users have downloaded the early beta of FP 1.4. We have a large community and active testers who test releases in the live environment. This documentation is based on build # 56 of 1.4. Even though its beta, it is more stable and robust than the previous version. We also integrated a magnetic swipe reader, and Authorize.net API Retails have used it. Its source code is hosted it in sf.net subversion, and we let s developers access its source code real time. Download the latest version of Floreant POS ( 1.4 Version 56 or onward) . In login screen click on "Configure Database." and Port should be the same as the server. The default password for Administrator is "1111". The restaurant owner can change it and also adjust the length of the password. USB Port based Magnetic card readers can be used to let user login with his Magnetic ID Card. Some of our users also successfully used Motor Drivers License. Replace logo.png in the config folder. Recommended size is 1024x786. When you start Floreant, it boots up with a single database with sample food menu. If you need to erase sample data you can recreate tables and skip option of sample data. Capacity and Tables are the maximum numbers of guests and Tables respectively. Leave Service charge & Gratuity % blank if you do not charge them. Kiosk mode is a full screen protected mode where a Food server cannot access the Operating system. You may clean up the interface by removing unnecessary order types from here. Uncheck what you hardly use. The terminal number identifies a POS workstation and should not be changed after it goes live. In case you are using higher resolution display or small touch devices you can change button height and font size. You can have one Report printer in your system. You can add as many Kitchen & Bar printers as you wish. In case your card reader is not able to read Card, Cashier can manually type the username, card type, card number, and expiry date. In case you have a separate terminal to read credit card you enter Ref# and complete transaction. If you turn this on prices will include Vat/Tax. You can create a list of taxes and add in individual items. Floreant also supports credit card pre-approval and batch-wise capture. Clicking "Authorize" button will show Pre-Authorized transactions. Admin or a particular user can log in and change tips. Groups are secondary level for organizing. Every Item can exist in one Category and subordinate group. When admin adds modifiers in the menu item, he can specify a minimum and the maximum number of modifiers. Logged in as Administrator. It shows all the buttons. In reality, a different user will get different features. Food server will be able to create and edit Tickets and Manager will get access to the cash drawer. Take out does not use Table number. Fast food shops cashier rings an order and closes it immediately. Add the total number of guests. Usually, every guest is offered beverage and headcount is used for reporting. First, need to choose menu category in the left sidebar. And in each category, there are several groups of food. Groups are almost standard in diff Restaurants while the restaurant may pick groups and arrange them in a different category. Its also possible same group can be in multiple categories. Modifiers are ways to note user preferences for some food item/package. it may have the option to have no or extra modifier. Kitchen Instructions are not mentioned in Bill but sent to kitchen printer. For example, some guest can order for the extra plate or make hashbrown crispy. This will also require CUST plugin. Every ticket printer has a barcode number. Floreant comes with basic kitchen display system. OROCUBE also provided pro version with bump bar support and extra settings. This shows a real-time update of all the Tables in a Restaurant. You need to have Free Floor Plan plugin to enjoy this features. Admin updates this to log differences of actual amount and expected cash. Manager or responsible food server can void a food. It is considered wastage. So a reason is picked from the predefined list. If food is already cooked item is not wasted. Back office reports are printed in regular Printer and they can be exported to a spreadsheet.